Beachamp Falls is very near to Hopetoun Falls, both of which reside in the Otways National Park, along the ever popular Great Ocean Road in Victoria, Australia. Beachamp Falls is actually a tad more accessible in terms of driving, though probably a shade more of a walk. We are talking about minutes from the car park, not hours though. The best time to visit is after winter when the river will be flowing well. It is a rainforest, however, so expect the odd shower. 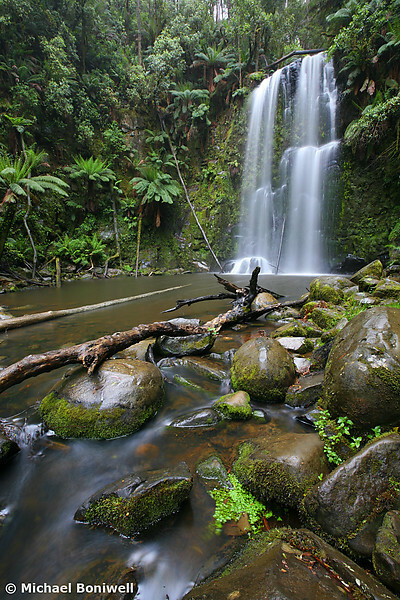 If you're ticking Otways falls there are several more to look out for, including Erskine, Triplet and Stevenson's Falls all of which are beautiful.